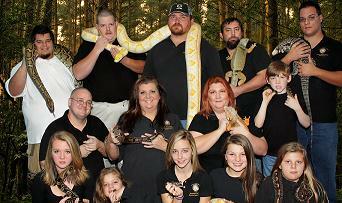 Home › Reptile Rescue › Southern Reptile Saviors Rescue, Inc.
Southern Reptile Saviors Rescue, Inc. These are my friends. They are the volunteers that make up Southern Reptile Saviors Rescue, Inc. located in Wilmington, North Carolina. That’s me right there in the middle with my mom. Kim is the lady next to mom and she runs the rescue. She was the one who took me in and got me healthy enough to find a new home. All the animals you see in that picture are happy now because they were rescued and given another chance at life. I still work with the rescue by going to educational shows and adoption days. I attract a lot of attention since I am the most handsome iguana in the world. You can find out more about the rescue on their Facebook page at Southern Reptile Saviors Rescue, Inc.